Come on in, the water's fine -- for fishing! Yes, the temperate waters of the Gulf of Mexico provide a good year-round environment for a large number of catchable fish species. Whether your preference is fishing offshore over the wrecks or stalking lunkers in the backwaters, there's plenty of room for fishing in solitude. Naples has many experienced guides to help you catch that trophy. But if you want to explore on your own, there also are plenty of marinas and tackle shops for boat rentals, tackle and advice. And, if you would prefer, there are places where you can fish without a boat. 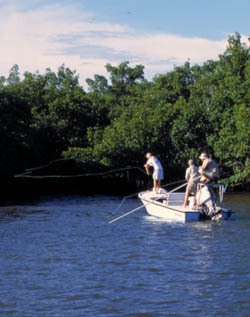 Some of the more popular spots are our rivers and the Naples Pier. Many people also fish the canals , especially where and when the tidal currents are relatively strong. The beaches can also be productive, especially at dawn and at dusk. Whether your preferred technique is fly, spin, plug or bait, you will enjoy fine fishing in a great environment.